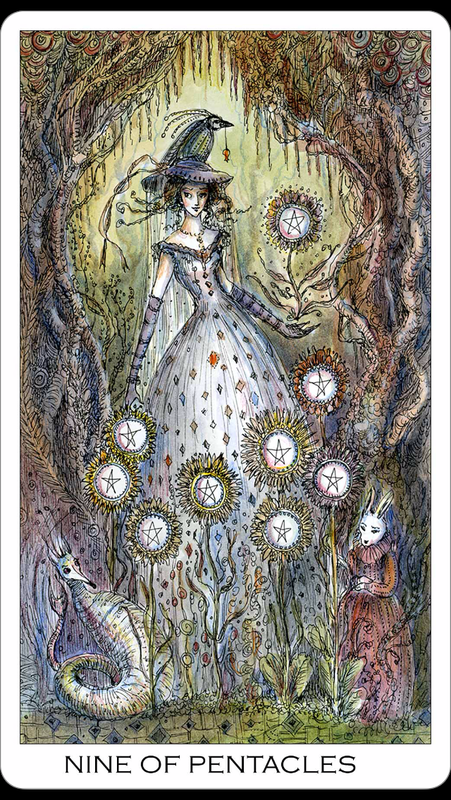 Card: Nine of Pentacles – from the Paulina Tarot by Paulina Cassidy. “This woman enjoys the abundance of her garden amidst the company of loved ones. From her hand sprouts a ninth flower, representing the arrival of something desired. 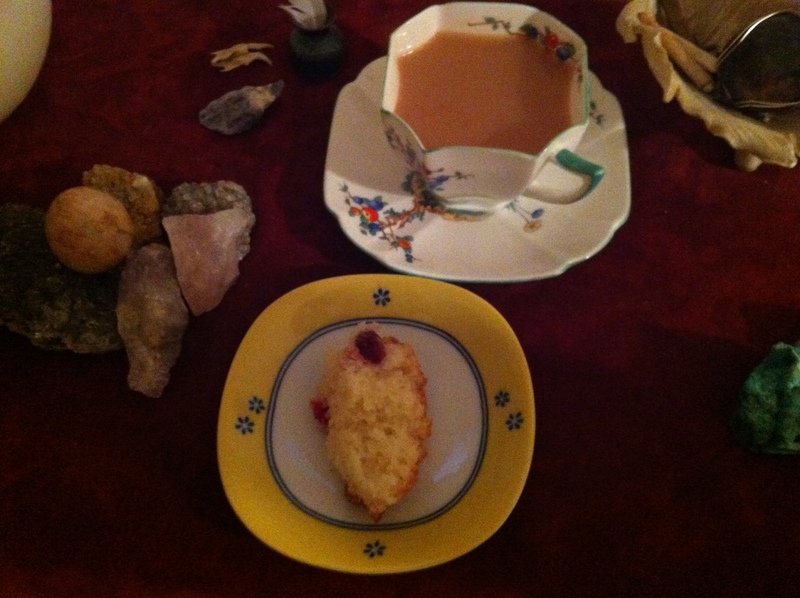 Message from the Faeries: Congratulations! Job well done! Kick back and relax, and enjoy the fruits of your hard labour. This week all of your work is going to pay off and you will be able to reap what you have sewn. See all the flowers blossoming with coins in this card? Imagine this as the abundance that you will be harvesting this week. Abundance can come in so many forms. Often people think about it in terms of money, and while a financial gain may be a possibility for you this week, we would like you to consider other ways that you can gain material wealth. Abundance can appear in all physical forms. Money, clothes, books, cars, houses, food, and even people! There is no limit to how abundance can come into your life, just as there is no limit as to how much wealth can into your life. Abundance can also come to you in non-physical form. Such as: an answered prayer, a new idea, an inspiration, a burst of energy, or a sudden overwhelming feeling of fulfillment. You are being showered with blessings this week. Open up your arms and your heart recieve these gifts. Enjoy your bounty, and don’t forget to express gratitude for all that you have. This is a week where you can truly say: Life is great! And so it is. 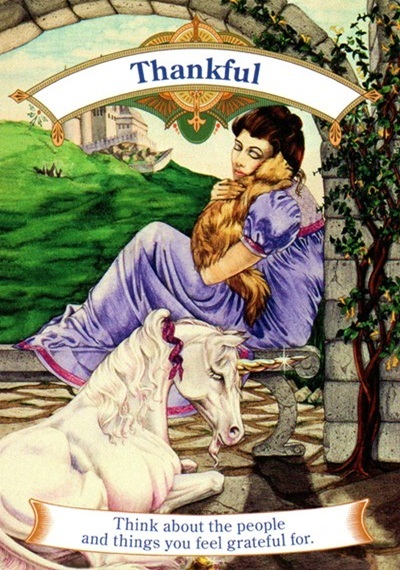 Card: Thankful – from the Magical Unicorns Oracle Cards by Doreen Virtue. 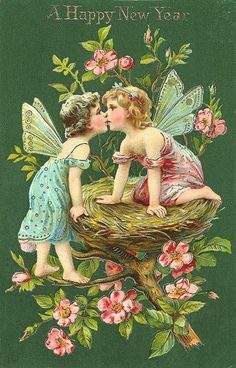 Message from The Faeries: Energetically, this is the perfect week to take the time to do an inventory of all the abundance in your life and to feel a deep, genuine sense of gratitude for all the wonderful people and things in your life. One of the reasons that it is so important that you do this for yourself is so that you can open the gates of your heart to allow more amazing things into your life. Lately you have been conjuring some amazing dreams for yourself. You have set your sights on some pretty fantastic things. In order for you to manifest your heart’s desire, you must take some time to look at all the abundance in your life and to feel gratitude for what you already have instead of focusing on all the things that you don’t have in your life. Gratitude is one of the key elements to having a life full of joy and abundance. When your heart is full of gratitude, your heart is always open to receiving all the of the bounty that is life has to offer you. When you are feeling sorry for yourself, or when you are unable to see how much you have to be thankful for in your life, your heart is closed off to receiving so much love and abundance. We are asking you to have a really good look at all that you have. Isn’t amazing? Aren’t you grateful? Have you given thanks lately? Remember, when you are giving thanks, remember to give thanks to yourself for creating such a wonderful life for yourself. Take responsibility for all that you have and for you have created. You are creator in your life’s journey. Then be thankful to all the people in your life that helped create your fantastic life. Be grateful for all the assistance you have received – from your guides, the angels, your guardians, your ancestors – thank them for all their hard work. Thank all living things for all that they have sacrificed for you – the plants, the animals, the elements. Everything that you have in your life is the result of hard labour, of your own and others. Be grateful for everyone’s hard work. Be thankful. When you look at the whole picture, you realize how much love and effort went into what you have. Are you thankful or are you taking for granted? Please allow your hearts to swell up with love and gratitude. Give thanks and open your heart to receive more. You deserve it! You deserve to all that your heart desires. We are very thankful for all of you. Use the passcode VALENTINE15 to receive $5 off any tarot reading by Erin here on her Etsy shop for this week only. Wow! 2014 has been quite the year. Many wonderful things have happened and lots of not so wonderful things too. I’m ready to put this year behind me and I am very much looking forward to starting 2015. Thank you everyone for all of your love and support. Your kind words and feedback keep this blog going. I can’t wait to do more readings for you in 2015 and to do a lot more writing. 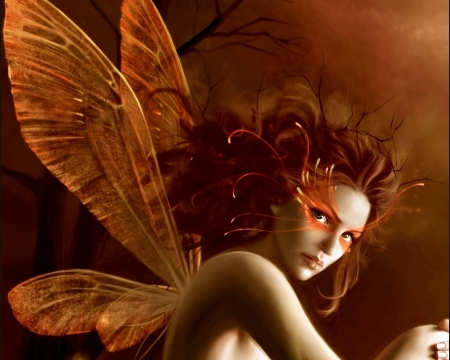 The Faeries have taught me so much, especially in the last few years, and I am so deeply grateful for all that they have shared with me. It really is a blessing to have them in my life. I can’t wait for all the wonderful things that we will learn together in 2015. I’m going to spend this evening peacefully in my home, enjoying some music and starting all my prayers and dreams for the New Year. I’m going to light some candles, burn some incense, sage, lavender and cedar, and leave out some offerings. I hope you all have a wonderful time and I am sending you all lots of prayers and well wishes for 2015. May the New Year be filled with love, laughter, good health, joy and abundance. 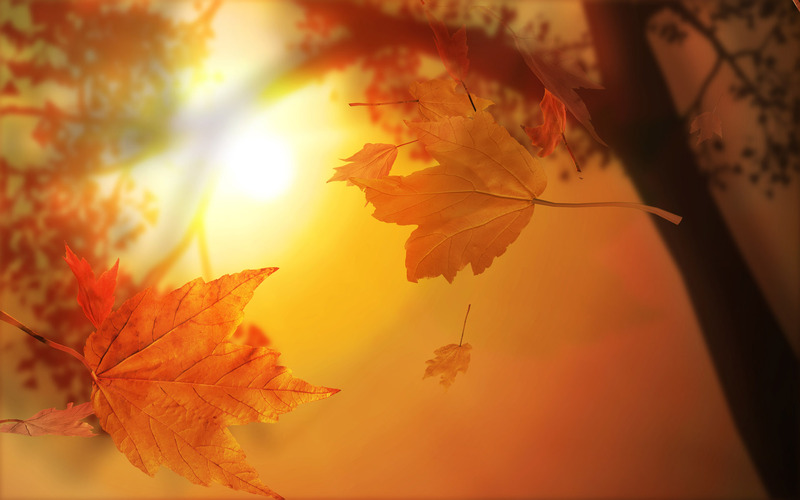 Today is the first day of the Fall Equinox, where I live. Autumn is my favourite season. I love watching all the plants and scenery change. I love watching all of the leaves turning colours and then falling from the trees. I love the smells that come with the leaves getting wet and decaying. It’s not a morbid thing, Fall. It’s just another part of our natural life cycle. Transformation. Some plant life and some animals are in the process of dying right now. There are some plants and animals that going to sleep or are getting ready to hibernate. Generally speaking, things are slowing down a bit. The days are getting shorter – less sunlight. Our natural rhythms are changing as well. Because there is less and less sunlight in the day, we might find ourselves having less energy. We might find ourselves getting tired earlier in the day. Some of us might be hungrier than we usually are. Fall brings with it many changes. I love the feelings and sensations I experience during this season. I also know that with the changing of seasons come other big changes in my life. Instead of fighting these changes, I find it easier to just let go and enjoy the process. It’s quite natural after all! There is also a New Moon right now, and so I think this is a really great opportunity to take some time to write down some things that I would like some assistance with letting go of, as well as writing down my gratitude for all of my abundance. I will also take the time to write down one of my heart’s desires, and make the effort to open up my life for it to arrive. What will you do to celebrate this time of change? 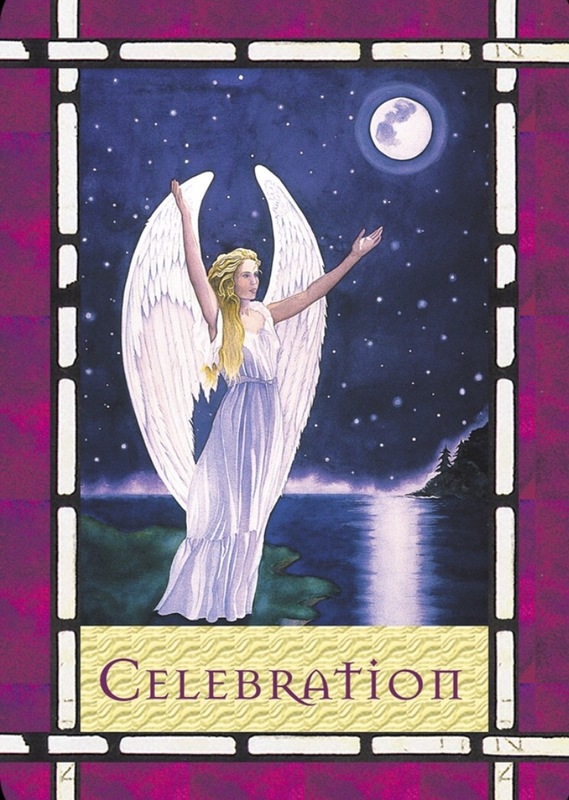 Card: Ace of Air – from the Angel Tarot Cards by Doreen Virtue and Radleigh Valentine. 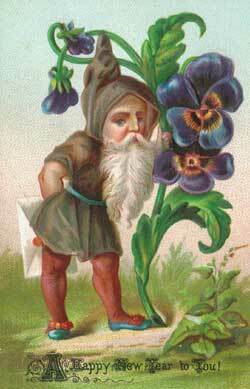 Message from the Faeries: The number one in the this card marks the beginning of this new chapter in your life. All the wacky, crazy, tumultuous stuff that has been going on for the last month is finally winding down, and you are now shifting into the next phase of your life–cycles. All the other Air cards in this deck are represented by unicorns, but this card is unique in that it is a pegacorn, not a unicorn. This pegacorn has spread it’s wings and is contemplating taking flight. 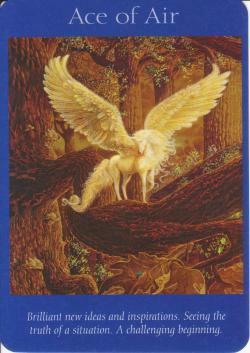 This card represents you on your journey, getting ready to take flight in a new direction. You’ve been working through a lot of stuff and made a lot of healthy changes in your life. Your taking better care of yourself – eating really healthy, getting exercise and taking the time to peace-out when you need to. Now that you’ve got the healthy patterns down, it’s time to focus on a project that you have set ahead for yourself in the future. The future is now. The time is now for you to move forward and jump into new projects, explore possibilities and do something you’ve never done before. What is it that you really want to be doing right now? Set aside some time for yourself to pull out your dream boards, journals and wish boxes. Review what you had set for yourself in the past. Do a mental check mark of all the things on the list that you have accomplished. Look at the ones you haven’t completed or started yet. Decide if these are still your goals and aspirations. Discards the things you no longer want and make a fresh board, wishlist or journal entry of what you want to be doing right now. Once you’ve decided what you want to be doing right now in your life, and what your new heart’s desires are, begin to take steps to living the way you want to live and actively make choices that put energy and love into your dreams. Everyone morning when you wake up, express gratitude deep in your heart for all that you have. Be thankful for all your wishes come true. Then be sure to remember to pray. Pray and give thanks for all that you have. Pray to give you strength and courage to be your authentic self. Pray for all the little things that you have forgotten to give thanks for. Take nothing for granted and always make choices and steps towards living the life you want to live. You can do this! We have all the faith in the world in you.